Osprey Ariel 65 is the perfect choice when you are planning a hiking or camping trip. At the same time, when you need a stable and comfortable backpack for the long haul.This women’s specific Ariel backpack is an easy top loading streamlined and a weightless custom built hiking backpack. However, this awesome design is especially for long-haul comfortably. It is taken very much care to balance capacity and load. For this reason, this backpack presents the best backpacking backpacks on the market. Of course, this Osprey women's backpack is specially made to be worn for extended lengths of time. This is the most suitable backpack to take with you on medium and long distance camping. There are not many manufacturers who produce excellent women-specific gear, but Osprey is one of them. Meanwhile, this osprey women’s backpack comes in three lovely and attractive colors: vermilion red, deep sea blue and summer wheat brown. Moreover, it does come in different sizes based on` the users torso length. Accordingly, the available sizes are like extra small, small, medium and large. Additionally, the Ariel 65 backpack has custom sized components. Ultimately, the user can choose the hip belt and harness as per her required size. The hip belt straps can be adjusted by pulling forward. Finally, allowing you much more leverage for a better fit to maintain the bulk of your load on your hips. The harness straps can be adjusted as per your torso length. Consequently, the variation of your gear load will be there as the camping trip goes on. The adjustable chest strap can be truly customized to a women’s figure. Osprey Ariel 65l is much more of a long-haul style backpack and is specially fabricated to hold more weight comfortably. Osprey 65l provides the best choice for a hiking where you requires a multi-functional backpack. All essential features of this model are the same as for the camping backpacks from series Osprey Ariel made for men, with some additional unique features especially for women. As this is designed for women enthusiasts, the main focus of this hiking backpack is the excellent fit and comfort. A large volume improves its versatility and ensures that you will always have enough place to haul during your nature out. A major benefit of the Osprey Women’s Ariel is the detachable top pocket. On the other hand, the top lid is suitable for carrying a separate pack for small side trips. The top lid pocket is having two compartments. Actually, the top pocket functions as a cover over the drawstring closure on the top of the backpack. With this Ariel 65 backpack, you can detach the top pocket from your backpack that you can take with you in those moments when you are heading off the trail and into town. The dual side compression straps of this Osprey women’s Ariel 65 backpack keep loads steady and balanced. These straps help for carrying longer things like tent poles, hiking stick etc. The dual access stretch mesh side pockets give the backpacker a superior extra effortless gear organization. These pockets feature the easy storing option for hiking or camping. Dual zipped hip belt pockets provide secure storage for frequently used things during her long haul. The hipbelt pockets give easy access and storage for snacks and devices such as a headlamp or digital camera etc. Strong J-zipper on the front panel provides quick access to gear in the main compartment during the course of the tour. Stretch mesh side pockets and zippered hip belt pockets help you lot of easy access storage options. The built-in cord loops are provided to attach an accessory pack such as Daylite or Alpine Pocket in case of requirement. If you require extra volume you can opt for additional Osprey's Daylite Backpack. This cord loop attaches the accessory day packs externally. Two horizontal StraightJacket style compression straps compress the load. This feature enables you to compress and stabilize the load during travel. There are tool attachment points and places for keeping extra accessories on the exterior. Dual tool loops hang the tools during hiking. It is easily accessible during hiking. For keeping and storing the sleeping bag, easily accessible sleeping bag compartment is provided. However, the sleeping bag is taken during long travel. For carrying sleeping pad an adjustable and removable sleeping pad straps are provided. The integrated sleeping bag compartment secure your sleeping bag tight and secured during haul. The external hydration sleeve in back panel supports refilling and prevents pack contents from spills due to jerk. 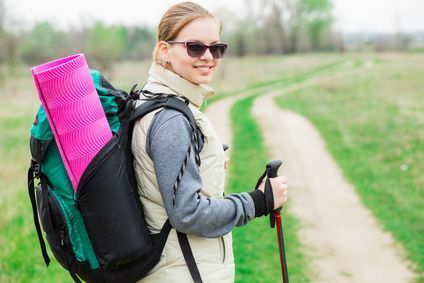 The user can tuck away trekking poles fast without having to remove their backpacks. Actually, for this purpose, Stow-on-the-Go trekking pole attachment is provided. It can carry heavy loads during extended hikes, travel and even during wet weather. The structural integrity of design makes this osprey product highly supportive and comfortable. A vital point to choose the Osprey Women's Ariel as one of the best camping backpack is because of the accessibility and comfort. A lot of research and fact has been taken into consideration for fabricating this backpacking backpack. Moreover, this pack is accessible from multiple directions and a number of different zippers. With a lot of benefits in a single backpack, it is easy to see why these Osprey backpacks become so highly recommended.